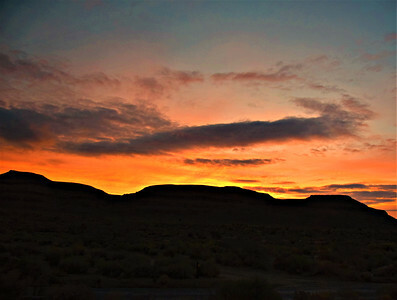 I was up early this morning and watched the sunrise from our campsite here in the Hole-In-The-Wall Campground in Mojave National Preserve. As the sun rose, I took this shot out our back window. 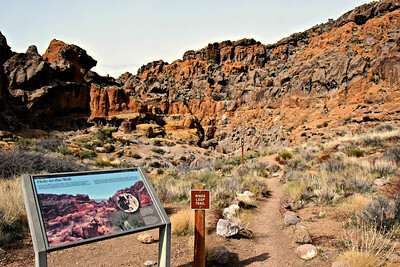 Around 9:00 a.m., we started out for our first hike of the day - the one-mile Rings Loop Trail. 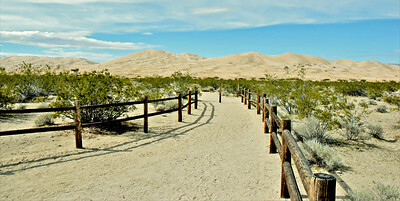 Near the entrance to the camping loops is the short Nature Trail. 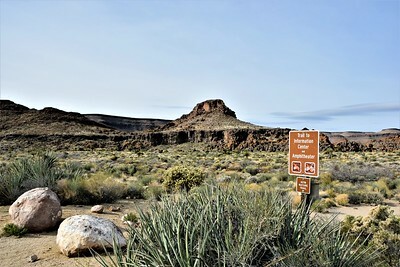 At this intersection, you can go left to the Visitor Information Center or right to the picnic area where the two loop trails here end. 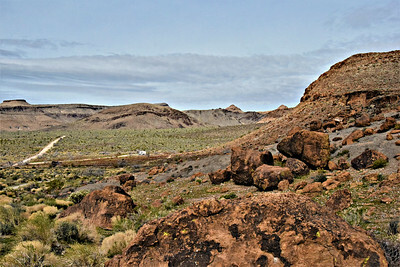 as the Rings Loop Trail begins in the front parking lot. It was a weird morning as the sun was muted by a thin cloud layer, more like a haze. Blue sky appeared occasionally as we walked clock-wise around the small mountain, but it wasn't the bright blue we had yesterday. 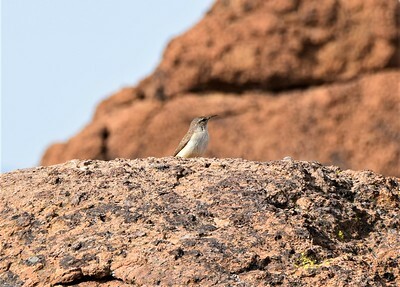 Some early morning bird songs were very pretty, and we got a nice look at this Rock Wren. 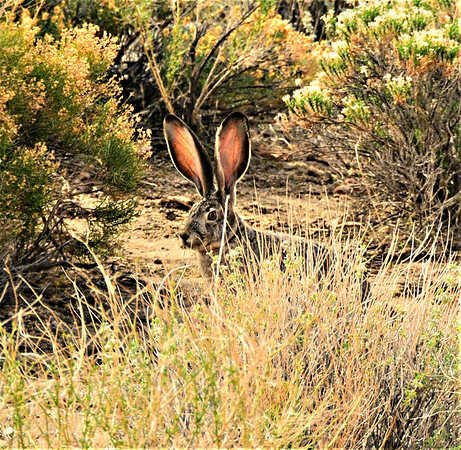 The Black-tailed Jackrabbits appeared often, but they are shy about being photographed. We got a partial view of this one. 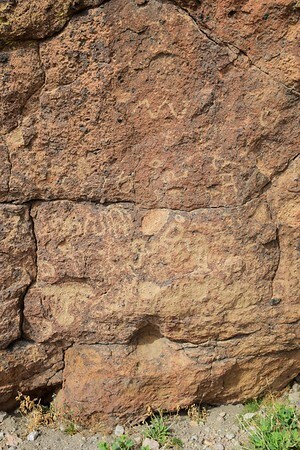 We came upon a sign about "Cultural Signs of the Past" and the boulders near the trail had some petroglyphs. 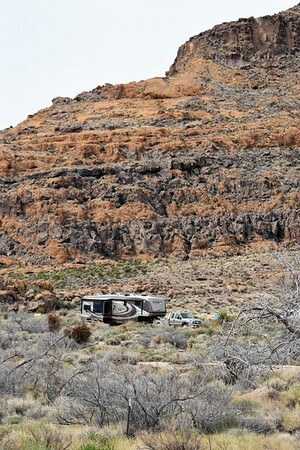 Continuing around, there was a great boondocking spot down below. 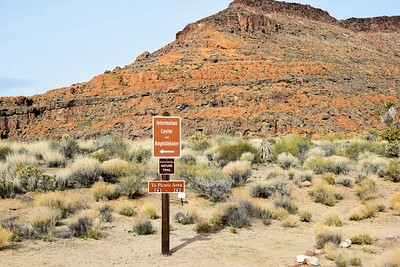 A downside might be that this trail runs fairly close to the campsite, but although the Rings Loop Trail is popular, it certainly doesn't get the traffic of a National Park trail. 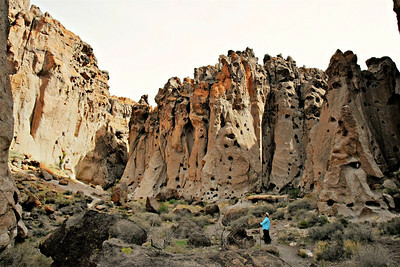 We wouldn't hesitate camping there, and we will try to remember to check out the access road. We spoke to the campers as we passed, and then we went through one of the fences - there are free range cows and sheep in the Preserve. The scenery was hard to beat on the backside of the mountain. 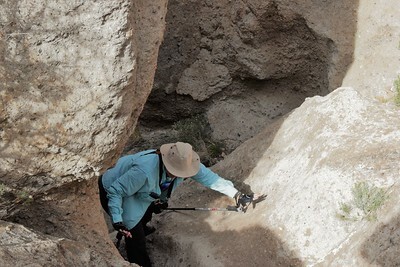 With her binoculars, Linda checked out all the holes in the rocks looking for nesting raptors or ravens. At this intersection, we continued right into Banshee Canyon. 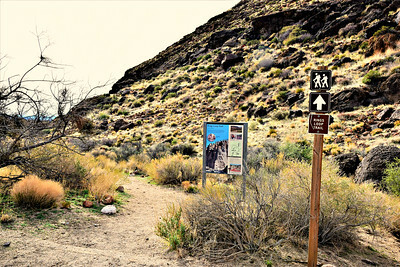 A left puts you on the eight-mile trail to the Mid Hills Campground. The park's website says this about Mid Hills. 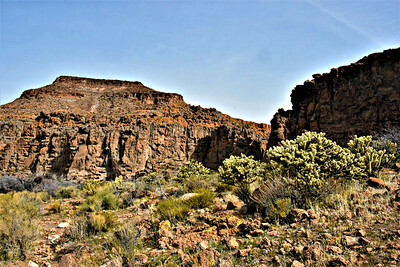 The Hackberry Fire swept through the Mid Hills area in June 2005, burning much of the vegetation. 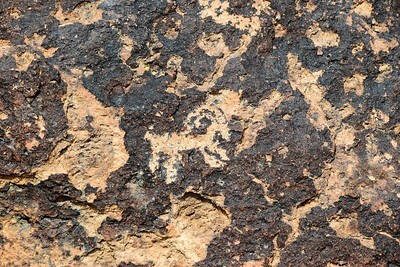 About half of the 26 campsites were left unburned, however—they remain surrounded by pinyon pine and juniper trees. 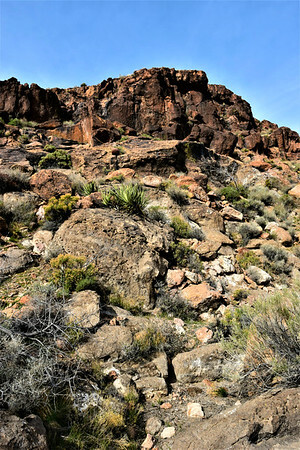 At 5,600 feet in elevation, Mid Hills is much cooler than the desert floor below. 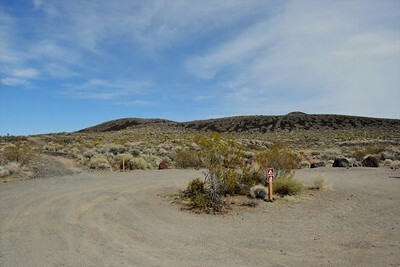 The access road is unpaved and is not recommended for motorhomes or trailers. 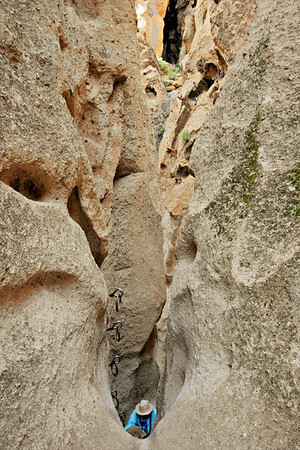 Getting ready to enter the Banshee slot canyon. The slot is on the left side in the photos above. Linda entered first to add some perspective. 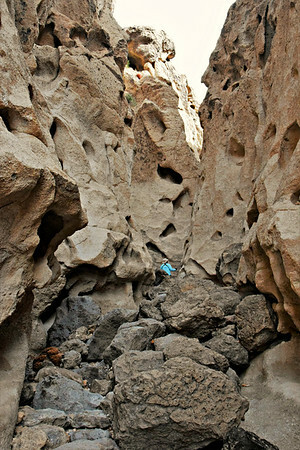 Compared to other slot canyons we've been in, this one is really short. 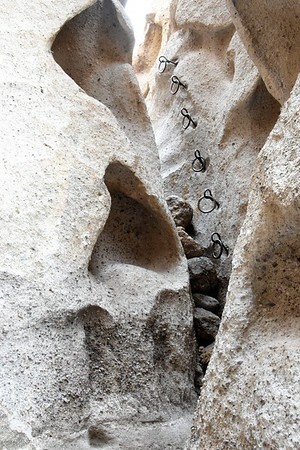 But, it has these rings to help you climb giving it a unique feature that provides the trail its name. I went first using the rings as handholds and using the ring supports as steps. They were quite solid. 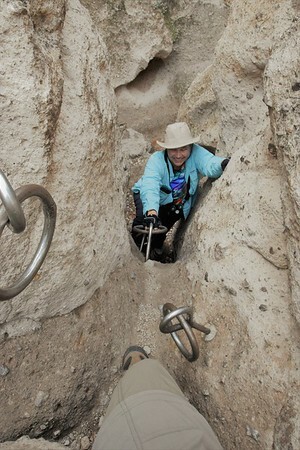 Once I was up this first section, Linda was ready below. She made it just fine. I had to give her a hand at the top, and I'm not sure she would have made it by herself, but we managed. Here is the next set of rings. 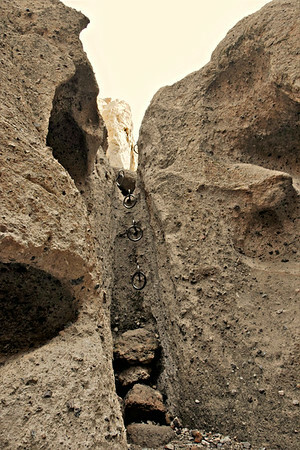 This section was a little bit trickier. Both sets could have used one more ring at the top. and then stepped back down and pulled her up the last step. 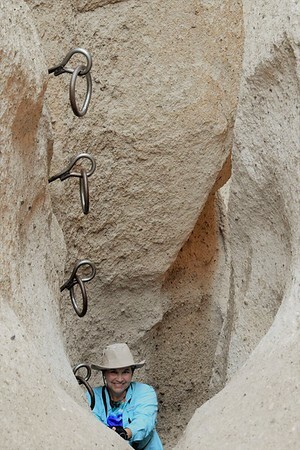 That was it for the rings, but we still had another scramble through the rocks. 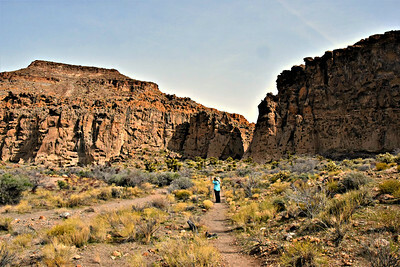 Soon, we were out of the canyon and in the picnic area. The signs would seem to indicate you can start the Rings Loop here, and you can, but it's easier to do the loop clock-wise and use the rings coming up rather than going down. That was a fun, scenic little hike. 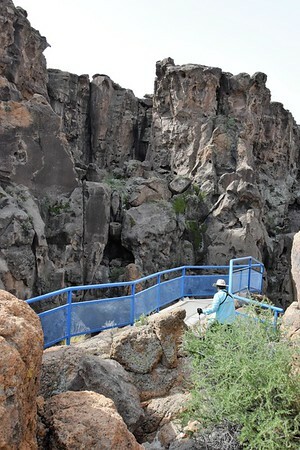 In the picnic area, there is a short trail to a viewpoint. It seems out of place with the bright blue railing, and the view really isn't all that worthwhile. Might as well do it 'cause you're there, but you don't miss much if you skip it. 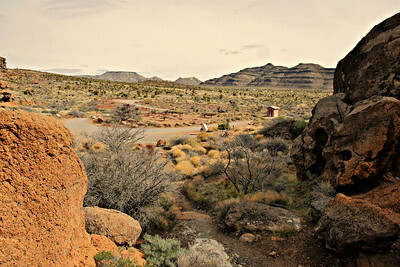 However, the view over the picnic area toward the campground is nice when you are coming out. 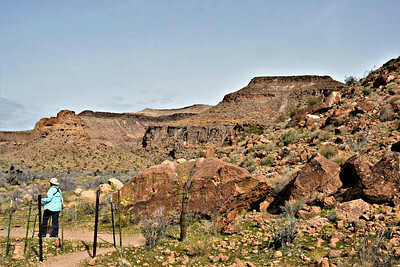 We walked back toward the campground with the large mesa in the background. 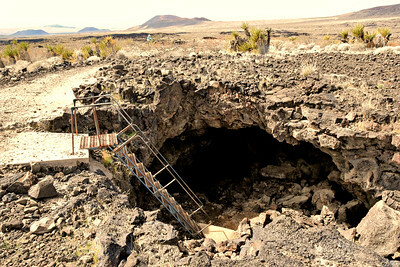 After a few minutes, we headed out in the Jeep to go to the Lava Tube way on the other side of the park. We turned left (north) out of the campground and the road immediately turned from paved to unpaved. I took a photo of our rig from the road before moving on. The dirt road was okay at first but turned quite washboard-y. 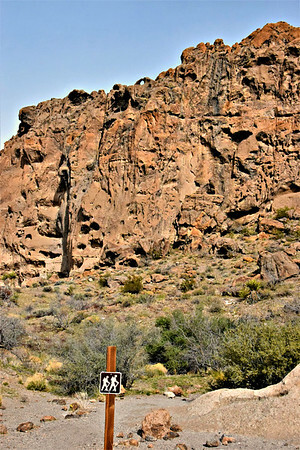 We drove nine miles on Black Canyon Road until it ended at Cedar Canyon Road. 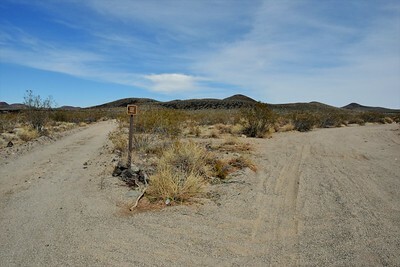 We turned left (west) on Cedar Canyon Road and then went another six miles to the Kelso Cima Road, one of the main north/south paved roads in the Preserve. 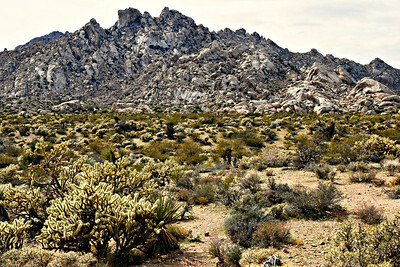 That portion of the drive also included a section of Joshua Trees as far as the eye could see. On Kelso Cima Road we turned left and headed south for 14 miles. Then we took Kelbaker Road northwest for 15 miles. 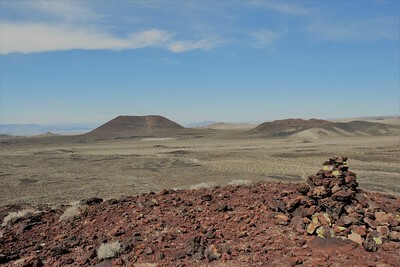 Going over a ridge, we saw several red cinder cones in front of us as the terrain changed. 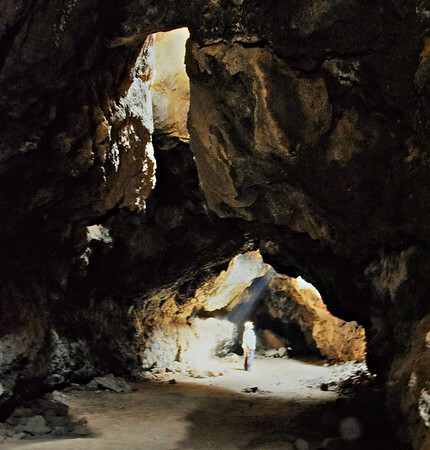 We were looking for Aiken Mine Road, but there was no road sign nor a sign for the Lava Tube. We found an unpaved road in the area where it was supposed to be, so we took it. Unfortunately, I forgot my map of that specific area and the big park map didn't indicate how far in we needed to drive. 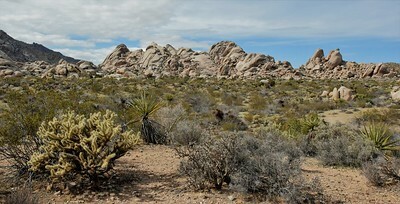 Not far on that road (which turned out to be Aiken Mine Road), this Joshua Tree was begging to be photographed with a cinder cone in the background. 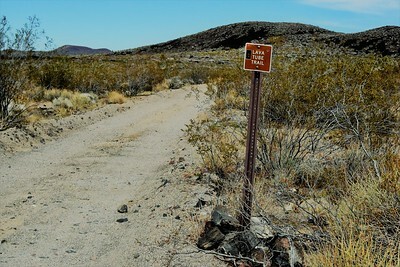 This road was also very washboard-y, but the Jeep could handle it fine. 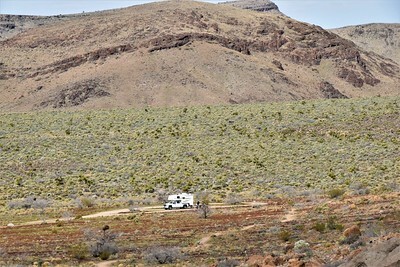 About a mile and a half in, we saw a Class B motorhome in a boondocking spot. 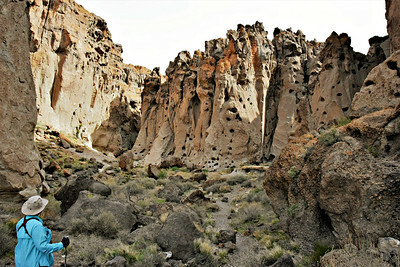 Continuing on, we saw a couple of hikers off to our left and thought "They must be going to the Lava Tube". 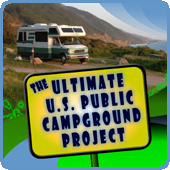 We pulled into the large, unmarked parking area that had a fire ring and was clearly another boondocking spot. 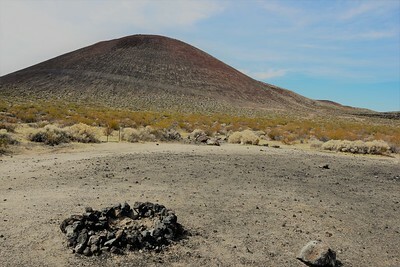 Pretty much anywhere there is a metal or rock fire ring, you can camp ... although getting to many of the spots may be quite rough on RVs. This didn't really look right, but we followed the hikers up a rocky road. 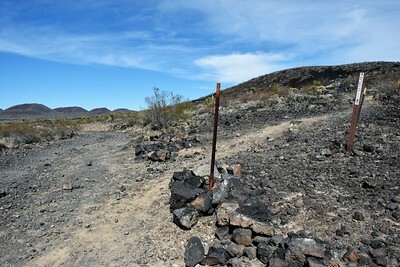 They veered off to the right, and we continued to follow a visible, worn path up along the side of the cinder cone. We found a large cairn, but we were pretty sure we were in the wrong place by then. We walked back down and found the other hikers. 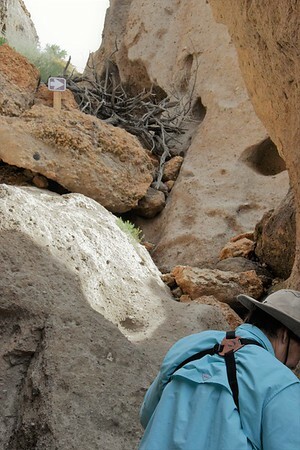 It turns out they were geologists and we were, in fact, in the wrong place. 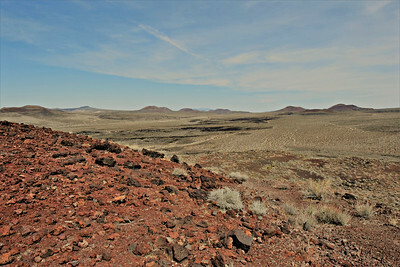 But they pointed the way out toward a visible lava flow, and we could see where we needed to go from the side of the cinder cone. Our Jeep was about a half mile way (guessing), so we had an extra mile of exercise with our little side trip, but we met some nice folks and there were some good views from up there. Back on the Aiken Mine Road, it turned to the right, but we saw we were supposed to go straight - the first sign we saw pointing us in the correct direction. It's about 4.5 miles in from the paved Kelbaker Road. From there, it was only about a quarter mile to a marked parking area. There was another rocky road we were supposed to walk up. I did remember reading we were to walk about 300 yards. I kept looking behind trying to think of three football fields. I don't think it was anywhere near 300 yards before we came to a worn path off to the right but, once again, there was no sign about a Lava Tube, just a couple indicating "no motorized vehicles". But that turned out to be it. Just a short walk from there was a big hole in the ground with a ladder going down. 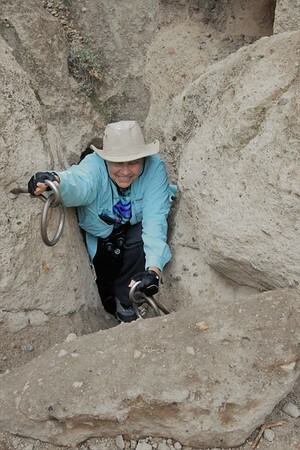 The ladder was in good shape as we descended into the hole. We went down a little using a small flashlight, and then the ceiling got lower. But we could see another chamber beyond the initial one. It wasn't quite crawling, but there was certainly some bending and there was danger of smacking our heads on the rocks above. Finally, we were back inside where there was a natural skylight, and a view of what I had seen online. Linda positioned herself in the beam of light, and the photo came out great. When she got up, we noticed that the dust made the beam show up better, so I took a few more shots. We explored just a bit more and I took this last photo. 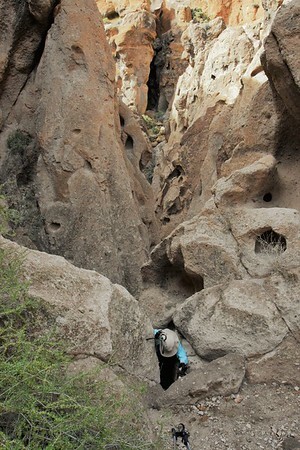 We got back to the ladder just as another couple came down, so we exited and headed back down the trail. We paused for a moment to check out the old lava flow below and the view beyond. Back at the Jeep, we quickly made our way back over the rough road to the pavement. Rather than going back to the campground the way we came, we decided to take the paved road south to I-40 so we could verify it was okay coming that way when we leave on Friday. After 15 miles on Kelbaker Road, we stopped so I could get a photo of the Kelso Depot Visitor Center with the Providence Mountains in the background. 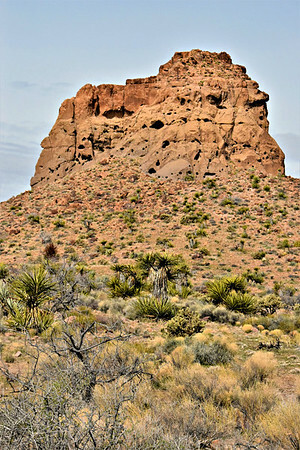 There are a half dozen or so small mountain ranges in Mojave National Preserve with the highest topping out around 8,000 feet. Seven miles south of the Kelso Depot Visitor Center, we turned right (west) to go the four miles to the Kelso Dunes parking area. The map indicates it's a paved road, but it is in such bad shape I don't know if I would qualify it as "paved". Just onto the road, we stopped for a panoramic shot of the massive dune field and the Kelso mountain range. 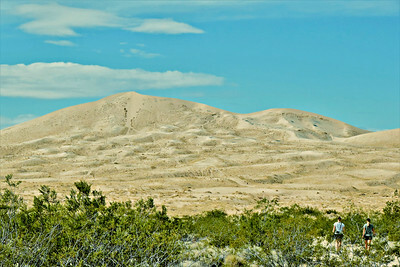 The Kelso Dunes rise to over 600 feet and cover 45 square miles. They are quite impressive. Since we have hiked the Great Sand Dunes in Colorado (over 750 feet), we had no interest in hiking these. But we were surprised at the size of these dunes, and the fact that there are so few people here compared to the Great Sand Dunes National Park, it would be a great place to experience hiking in high dunes. 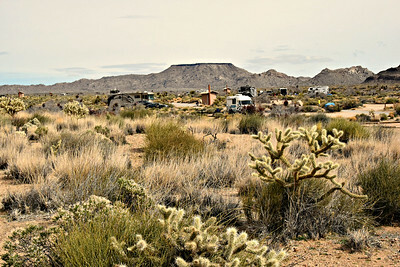 I had read there are several boondocking spots on the road past the Kelso Dunes parking area, but it was another unpaved, washboard-y road, and we wouldn't take our rig back there, so we didn't check it out. 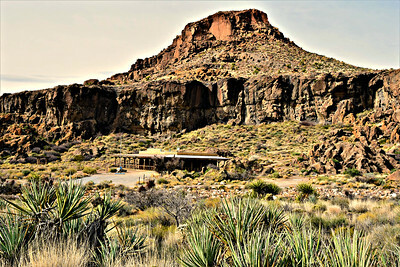 After Kelso Dunes, we continued south toward I-40. 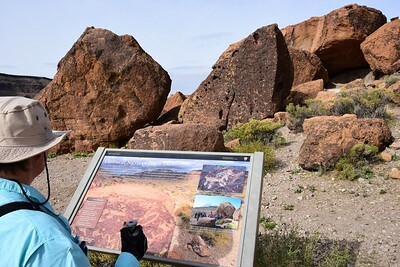 We made a quick stop at a viewpoint at the Granite Mountains. The paved roads through the middle of the Preserve are just fine for taking our rig through on Friday. When we reached I-40, we headed east and the views were fantastic. 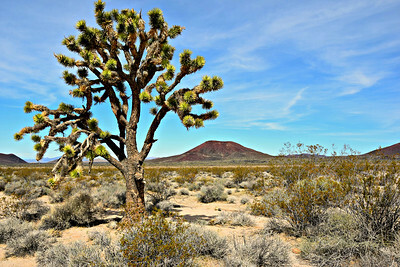 Linda has never been through the Mojave, and I was just a kid when I was last through here. We went to Exit 107 to fuel up the Jeep in Fenner. It's the only gas station in the 92 miles between Needles and Ludlow, and they are currently charging $5/gallon for regular unleaded. Yikes. We then backtracked to Exit 100 and started the 20 miles back to the campground. We stopped at the Mojave National Preserve entrance sign for a photo op this time. We drove over 150 miles in and around this huge park (1.6 million acres), and we're big fans. 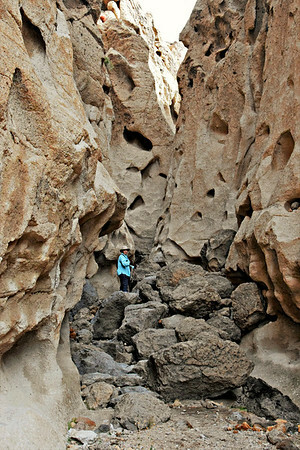 There aren't too many people, and there is great variety although there are relatively few developed hiking trails. I'm sure it's way too hot in the summer, but right now it's a great time to be here. 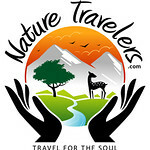 I so want to visit this park but there aren't any FHU campgrounds anywhere near by. Guess we will just have to boondock for a day or two sometime. So glad you got to climb the rings. I think it looks like so much fun! 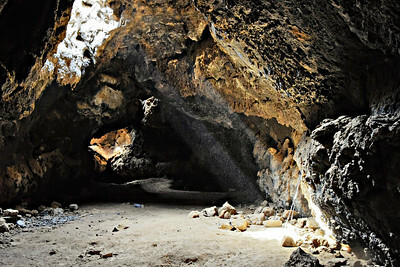 Love the photos in the lava tube. We'll have to add this area to our to do list. Great photos! Thanks for the tour. Looks like a place we'd love! 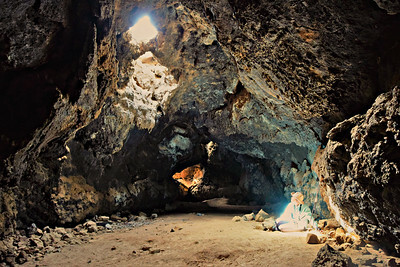 The Lava Tube is very cool.